Dr. Rahban embraces a thoughtful, personalized approach to chin augmentation. Dr. Rahban embraces a thoughtful, personalized approach to chin augmentation. He takes the time to evaluate each patient’s facial anatomy as a whole, along with their specific aesthetic complaints and concerns, before recommending a custom blend of procedures designed to achieve their desired results. What Sets Dr. Rady Rahban Apart, When it Comes to Chin Augmentation? One of Dr. Rady Rahban’s key components of his practice is his “knowledge is power” philosophy. He spends a significant amount of time one on one with each patient, educating you on everything you need to know in regards to that particular procedure, as educating his patients is of the utmost importance to him. He also enjoys educating others in his field and sharing his knowledge and skill that he has mastered over the years. One of the ways he does this is by teaching advanced chin augmentation courses. 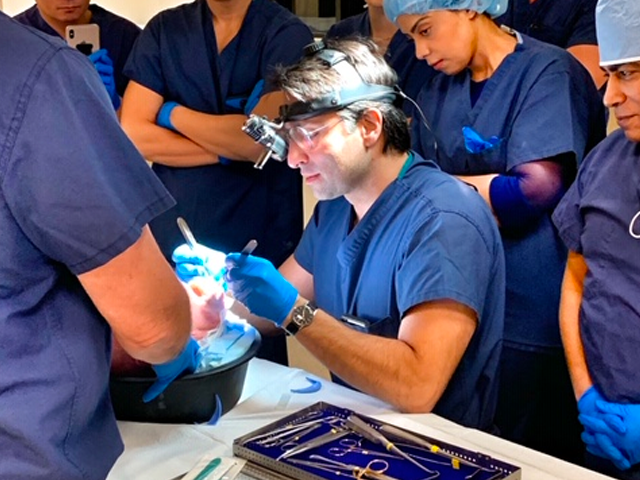 Implantech, the leading manufacturer of chin implants here in the United States, flies Dr. Rahban all over the world to teach his advanced chin augmentation techniques at their training courses. 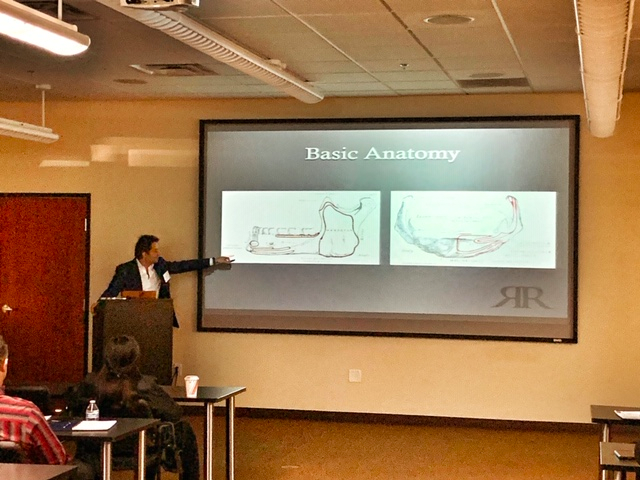 Dr. Rahban teaches in both academic conference type settings, as well as in smaller group settings such as cadaver labs, actually demonstrating and teaching his skills and techniques to other physicians in the field. 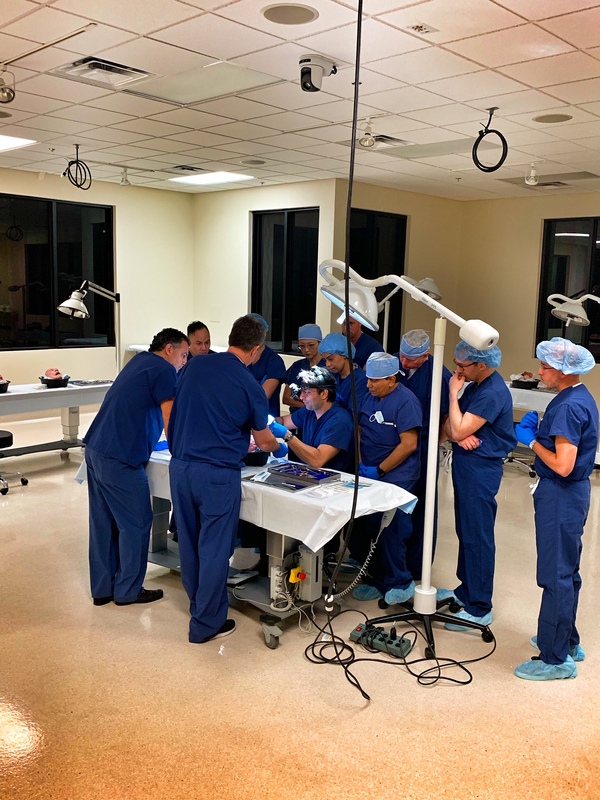 The photos you see at the top of this page are photos of Dr. Rahban teaching at an Implantech course in Las Vegas, NV. Implantech’s silicone chin implants, which are actually designed by the leading surgeons in this field, such as Dr. Rahban, enable permanent yet natural solutions for patients that yield results of a more youthful, attractive, and balanced facial profile. Implantech is the only chin implant manufacturer that uses state-of-the-art computer technology for the design, mold making, and production phases. This accurate process translates into the highest quality implants, ensuring consistent symmetry, predictable volume, and tapered edges to eliminate palpable margins. Implantech proudly maintains FDA certifications to assure the surgeon, and their patients, that each and every one of their chin implants is manufactured to the highest quality and safety standards. Unlike many surgeons, Dr. Rahban does not treat chin augmentation as a minor procedure. Many surgeons perform chin augmentation in their office under local anesthesia. Dr. Rahban takes up to 2 hours in the operating room under general anesthesia for his chin augmentation procedures, taking his time in order to create an accurate surgical plane and avoid damaging the surrounding muscles and nerves. Additionally, he spends a great deal of time figuring out which type and size of implant to use, as this is a major part of the surgery, in his opinion. Dr. Rahban is unique in that he has an entire consignment of Implantech chin implants at the surgery center. Therefore, he has many different styles and sizes of implants readily available for each patient. Most surgeons will have determined, aka made an educated guess, as to which implant the patient will need in the initial evaluation and pre-ordered it for the day of surgery. Therefore, as a patient, you will be getting that, and only that implant, since it’s the only option. For every implant style and size, Dr. Rahban has available, he has what we call a sterile sizer, or a “sterile copy” for each one. During surgery, Dr. Rahban uses these sterile sizers to actually place different chin implants in you so that he can determine which implant will compliment your specific features and create the most harmonic balance for YOUR face before selecting the final shape and size. In this way, Dr. Rahban maximizes patient satisfaction. Customized care that’s as unique as you are. A one-size-fits-all approach to chin augmentation does not work. Why? Because everyone’s facial anatomy is unique. Two patients can – and often do – suffer from recessed chins in two entirely different ways. “Patient A” may have a recessed chin and a weak jaw, while “Patient B” features a recessed chin, submental fullness and lax muscles. Both complain of a weak chin – but both need a completely different set of corrective procedures. That’s why Dr. Rahban gets to know each of his patients as the unique individuals they are. He gets to the bottom of what’s causing their cosmetic concerns and formulates a creative solution to address their issues. During your pre-operative consultations, the two of you will have lengthy discussions about your appearance and goals. He’ll ask you what bothers you about your looks and what changes you’d like to see implemented. He will attempt to figure out precisely why you’re unhappy with your chin, neck and jaw area, so that he can devise your ideal solution. Dr. Rahban approaches all of his surgeries with his renowned artist’s eye – which is why he often recommends a blend of procedures to his patients. In this way, he is quite unique in his field. Other surgeons will simply insert a chin implant as a quick fix to a recessed chin or a weak jaw. However, Dr. Rahban knows that this single procedure isn’t guaranteed to address all of his patients’ aesthetic concerns. After a number of thorough, pre-operative discussions and examinations, Dr. Rahban will know if a chin implant is all that’s required, or if you’ll also need submental liposuction, a fat transfer to the chin or even a nose job to finesse the results and ensure that you’re thrilled with your new look. In other words, you can trust that Dr. Rahban knows exactly what it will take to get the outcome you want. You deserve a surgeon who takes your chin augmentation as seriously as you do. Contact us today for a complimentary consultation, and let Dr. Rahban begin planning for your care.